A standard part of any military funeral is the ceremonial shooting of three volleys in honor of the deceased. The three spent shell casings are presented to his or her next of kin. 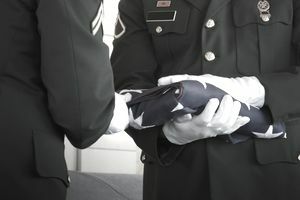 Anyone who is entitled to a military funeral (generally anyone who dies on active duty, honorably discharged veterans and military retirees) are entitled to the three rifle volleys, subject to availability of honor guard teams. But where did this tradition come from? The tradition dates back to the European dynastic wars, which were between 1688 and 1748. The volleys were shots fired on the field during a battle, signaling a pause in the fighting. It was intended to allow time for both sides to remove the bodies of their fallen soldiers from the battlefield. The two warring sides would cease hostilities until the firing of three volleys meant that the dead had been properly cared for and the side was ready to resume the battle. The three bullets represent the three volleys fired and the three words duty, honor, and country. The firing team in this ceremony can consist of any number of service members, but one usually sees a team of eight, with a non-commissioned officer (NCO) in charge of the firing detail. Whether the team consists of three, eight, or 10 service members, each member fires three times. The military funeral honors also include a ceremony in which the honor guard removes the flag from the casket and carefully folds it, with the blue field of stars facing up. Then, the folded flag is presented to the deceased person's family as a token of gratitude for that person's service. The flag detail often slips three shell casings into the folded flag before presenting the flag to the family. Each casing represents one volley. This gesture provides a slightly different meaning for the symbolism of the three bullets in a military funeral. Some military traditionalists argue that the shell casings should not be slipped into the flag as it's being folded since doing so would require opening a flap of the flag. Instead, the shell casings should be retrieved and presented separately to the next of kin. This funeral salute often is mistaken by people who aren't involved in the military as a 21-gun salute, although it is entirely different. The three volleys in the funeral salute are fired from rifles, not "guns." Therefore, the three volleys aren't any kind of "gun salute." In the military, a "gun" is actually a large-caliber weapon, such as a cannon. The 21-gun salute stems from naval tradition, and it is used to mark certain anniversaries, salute heads of state, and reigning royalty and honor national flags. The number of large-caliber guns used for the 21-gun salute varies depending on the protocol rank of the person being saluted. For example, if a president, former president, or president-elect dies, 50 guns will be fired at sunset at all military installations that are equipped for the salute depending on the protocol rank of the person being saluted.